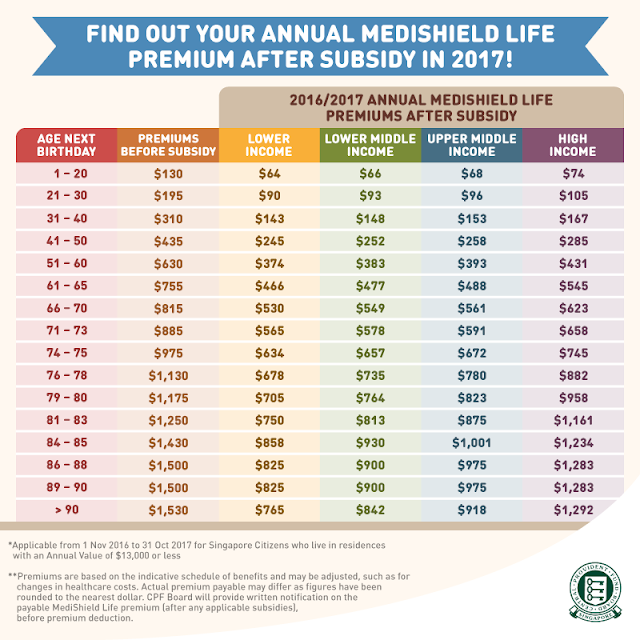 Invest Openly: Medishield Life - What Is Your After Subsidy Premiums In 2017? Medishield Life - What Is Your After Subsidy Premiums In 2017? If you have not already known, our revamped Compulsory National Healthcare Scheme, Medishield Life is heading towards its second year from Nov 2016 onward. During this transition period, Government is dishing out a couple of subsidies to ensure that impact of the premium increase is mitigated (even though the full Medishield Life premiums can be paid via your Medisave account, as long as there is sufficient balance). These subsidy rates are applicable to Singapore Citizens who live in residences with an Annual Value of $13,000 or less. Those living in residences with an Annual Value between $13,001 and $21,000 will receive 10 percentage points less than these subsidy rates. Those living in residences with an Annual Value of above $21,000 or own multiple properties will not receive these subsidies. Table applies to Singapore Citizens. For Permanent Residents (PRs), half of the relevant Premium Subsidy rates apply. PRs are not eligible for Transitional Subsidies. All Singapore Citizens enjoy 70% Transitional Subsidies on the net premium increase in the second year, i.e., pay 30% of the net increase in premiums from the former MediShield. "Lower income" refers to individuals with a household monthly income per person of $1,100 or less. "Lower middle income" refers to individuals with a household monthly income per person of $1,101 to $1,800. "Upper middle income" refers to individuals with a household monthly income per person of $1,801 to $2,600. Oh! By the way, for those who are covered under the Integrated Shield Plan with the insurers*, do take note that selected insurers are set to increase the premiums of selected plans (only on the insurer's portion) from 2017. So, do pay attention when you've received your upcoming renewal notice from your insurer.